Welcome to We Minored In Film, a pop culture blog run by two pop culture obsessives whose passion and level of knowledge for all things pop culture outweigh their academic credentials. Allow us to roll out the internet welcome mat and give you a Q&A tour of our new digital home. Below is a rundown of what this site is and who we are. Head here for an argument for why on earth the world needs yet another blog. What is your mission statement, if you have one? The mission of We Minored In Film is to articulate our unique viewpoint on American and British popular culture in the form of news stories, essays, and lists. This site is to serve the function of engaging in an ongoing conversation about that which we use to entertain ourselves. Do you only cover film? No; our primary coverage is of film and television with occasional coverage of books and theater and very rare discussions of video games. What type of film and television and whatever else do you cover? Our interests tend toward the geeky – science fiction, fantasy, animation, comic book – although we also share a passion for well done sitcoms, dramas, and classic film. That dictates what we cover. Just a guy (named Kelly Konda) and a girl (named Julianne Ramsey) standing in front the world asking it to listen to our rantings. Click or tap on our respective names in the previous sentence to jump to our full profiles. Links are also available at the bottom of this page. Currently, Wichita, Kansas. Check out our list of films, TV shows, and songs which have referenced the town of Wichita. If I find something wrong on the site, such as a faulty link or missing picture, who do I contact to cryptically tell them I found something and will only provide the answer to the question of “What and where did you find it?” if you can answer my riddles 3? Well, that seems like a particularly cruel idea. You could just kindly give us a heads-up. Either way, direct any such comments to Kelly Konda at support@weminoredinfilm.com. Thanks. Do you have a cool origin story, or did you both simply look at each other one day and blurt out “Let’s say the first thing that comes to our minds in 5,4,3,2,1” and then you both said “I want to start a pop culture website” at the same time? Actually, that would have been kind of awesome. Alas,our origin story is not nearly as immediate. 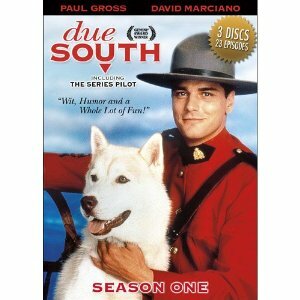 It all began with the utterance of the following phrase: “I wish I knew more people to tell about Due South,” a Canadian television show which originally aired from 1994 to 1999. The show centers upon an archetypal Canadian Mountie (Paul Gross) who is stationed at the Canadian consulate in Chicago but spends most of his time solving crimes with a Chicago Police Department detective (David Marciano first, then Callum Keith Renee). What appears, on paper, to be a hackneyed byproduct of an era of film and television run amuck with opposites-attract buddy comedies turns out to be a revelatory viewing experience with an endless supply of charm and sneaky ability to wield effective pathos, such as the infamous season 1 two-parter entitled “Victoria’s Secret”. No, seriously, these particular episodes, which detail the return of the Mountie’s long lost love, were so astonishingly good that we instantly had to tell everyone we knew that they owed it to themselves to watch them (first season is usually available on sale for only $5 U.S. Dollars at Target; just in case you were curious). But we ran out of actual people we knew to tell about the show, and announcing our love for it to all of our digital friends via networking sites such as Facebook and Twitter felt oddly unrewarding. Create a fansite? It had been done already, and done well, back in 1996. Plus, we realized we wanted to talk about more than just Due South. Thus, a pop culture website was the solution. The truth is in the form of countless, probably too long conversations about film, television, music, and theater over the years we have kind of been doing this for a while. We’re just going to start writing it down now. Read our argument with the voice of reason about whether or not the world needs another blog. I like your mission statement almost as much as your blog entries. Thanks…I think. That could be taken as a genuine compliment or as a slam on the entire site. I’m going with the former of the two, in which case thank you. Question for you folks. What WordPress theme are you using here? I really like how the page scrolls at the top to show your latest articles and I’m seriously thinking I should upgrade. We are using the WordPress theme called Sight (http://theme.wordpress.com/themes/sight/). It is actually a free theme. You can upgrade to customize fonts or colors, but we have not done that yet. We customized it by creating our own logo and placing it in the area designed for that, and we also replaced the standard background with an image of scratchy film texture (as a tie-in to the ‘film’ part of our site title). I really like the post slider feature as well, which we use to showcase both our most recent articles as well as our all-time most popular/ones we really love. However, if that’s what you want there are plenty of options. WordPress has 40 different themes, a mixture of free and premium ones, which feature a post slider at the top of the site (http://theme.wordpress.com/themes/features/post-slider/). Thanks for visiting the site, and I hope I was helpful. I actually remembered you can see which theme people use at the bottom of the page. Still, that is helpful. I tried it out and wonder if it would work. But you’re right, one can customize them, and if it’s free, a few tweaks ought to be cheap enough. What sources do you use to gather your data? Love your blog. It’s great to find other film lovers like myself. You have fantastic film knowledge. I would love for you to check out my blog. A follow would be greatly appreciated as well.